From the viewpoint of musical-theater junkies (which I consider myself to be), certain types of shows are best summed up by the words of Jane Austen: In Sense and Sensibility, Col. Brandon is said to be "just the kind of man whom everybody speaks well of, and nobody cares about." For our purposes, that translates as the kind of show that musical freaks discuss with affection and respect -- usually because it's one of the first they'd either seen or appeared in -- but that, really, they could get to the other side of life without ever sitting through again. For me, that describes almost all Rodgers & Hammerstein, most 1950s and '60s musicals and, specific to this review, Fiddler on the Roof, from 1964. It's not that Fiddler isn't a good show (far from it), and it's not that I've seen it too many times. (I've seen many other musicals many more times.) It's that the sentiment of shows like Fiddler and those R&H epics is just so calculated ... and calculated sentimentality seems dishonest to me. But what do I know? This musical version of stories by Sholem Aleichem (music by Jerry Bock, lyrics by Sheldon Harnick, book by Joseph Stein) about Jewish peasant life in Tsarist Russia was a monster smash that played for eight years on Broadway and further cemented the legendary reputation of Zero Mostel as the lead character, Tevye the milkman. As a side note, here's how screwed-up musical theater is: Mostel was blacklisted in the 1950s thanks to HUAC testimony given by Jerome Robbins. A decade later, Mostel appeared in A Funny Thing on the Way to the Forum, choreographed by none other than Robbins. Asked how he could work with the man who almost destroyed him, Mostel said: "We on the left do not blacklist." Robbins, Fiddler's original director and choreographer, may be another reason I'm not so crazy about this show: There's a lot of dancing in it. A lot. So much so that at times you're left wondering how people living under the daily threat of pogroms had time to get to all those dance classes. But that's just me being typically musical-junkie snippy. To normal people, i.e., the audience, Fiddler is hugely popular, loved precisely for its calculation and its sentimentality. And that's nothing to be ashamed about. 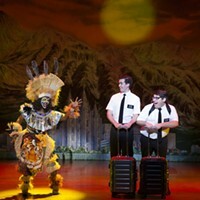 For as this Pittsburgh Musical Theatre production under the direction and choreography of Colleen Petrucci proves, Fiddler is a monument to the artistic-engineering possibilities of the Broadway musical. Robbins and original producer Hal Prince have created a battleship of a show, seamless and, in a way, relentless as it moves from start to finish. And Petrucci and company do a wholly remarkable job recreating that ship on stage at the Byham. With a tremendous assist from musical director Camille Villalpando Rolla and her orchestra, the entire evening is a professional, polished production. Jim Critchfield and Allison Cahill, as Tevye and Goldie, strongly lead an impressive cast of local theater professionals and theater students, with notable turns by Christine Laitta as Yente, Jon Cannard as Lazar, and all the various daughters and their suitors. And I gladly make special mention of the "bottle dancers" -- it's a shameless bit of Robbins choreography, but when the results are this entertaining, there's really no option but to acknowledge it. 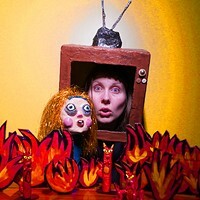 And a shout out to the technical side as well: Cory Pattack, Kim Brown and Alfred Kirschman for lights, costumes and set, respectively. 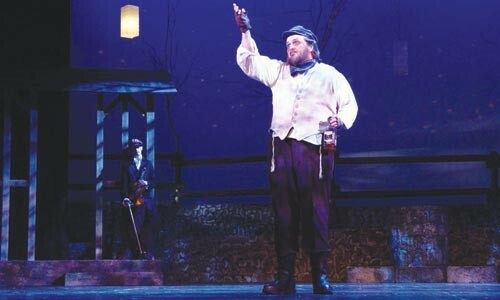 All day long he'd biddy biddy bum: James Critchfield as Tevye in Pittsburgh Musical Theater's Fiddler on the Roof. Photo courtesy of Patti Brahim.